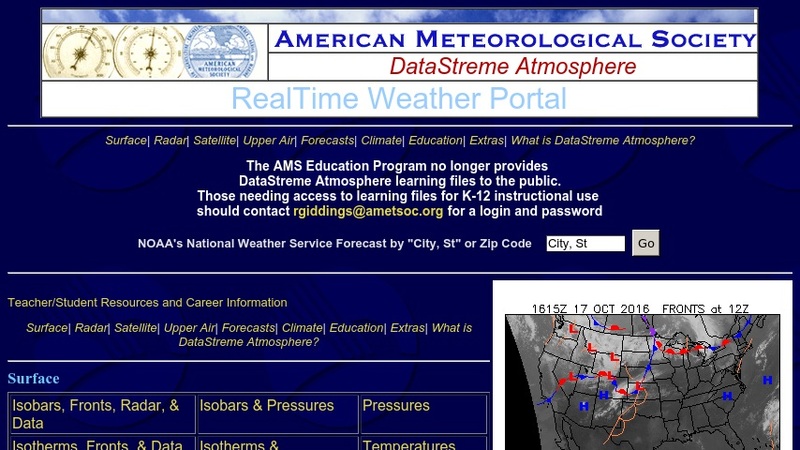 DataStreme Atmosphere, a major teacher enhancement initiative of the American Meteorological Society (AMS), is dedicated to "the training of Weather Education Resource Teachers who will promote the teaching of science, mathematics and technology using weather as a vehicle, across the K-12 curriculum." The website offers many radar, surface, satellite, upper air, and forecast maps. Students can find a helpful key to weather map symbols. In the User's Guide link, visitors can locate useful information about equipment requirements, learning files, and numerous weather products. Educators interested in participating in weather education can learn how to apply to the DataStreme Project.